This helps us better understand the careers our postdocs transition into so we can better serve our current postdocs. Build your professional network. Learn about how other NC State postdocs navigated their job hunt and ended up in a variety of careers. Talking to others who have been in your shoes is the best way to learn how to make the transition out of your postdoc. 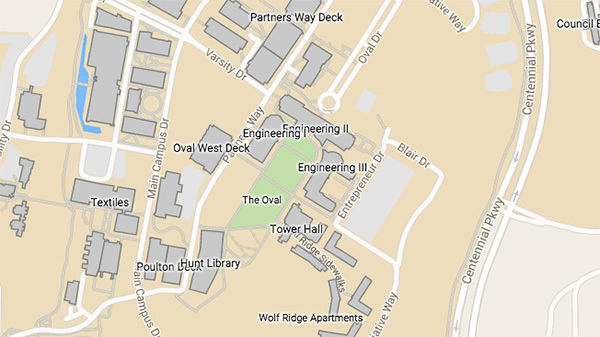 Are you a Raleigh-Durham area postdoc alum? We would love for you to attend the Postdoctoral Research Symposium (especially lunch), to be held on Friday, May 31st, at McKimmon Center on the NC State campus. Come interact with current postdocs and share with them the story of your transition to your current role. 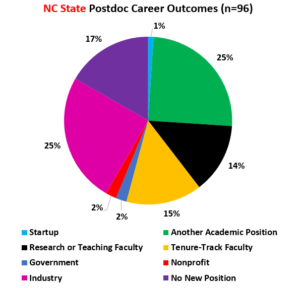 The Office of Postdoctoral Affairs is committed to sharing our postdoc career outcome data. The graph below represents the percentage of postdocs working in various career fields immediately upon leaving NC State University. This data is self-reported from an optional survey sent to all exiting postdocs. Data reflects 96 responses collected since March 2017. Still in the Research Triangle area? NCBiotech offers wonderful networking opportunities for those interested in careers in the life sciences. Their Jobs Network, which meets monthly, has structured networking opportunities.